I remember the day Chris Judd announced he was leaving West Coast. It was equal parts horror that your club’s best player was walking out and relief that the wait was over. It was like the conclusion of many long-term relationships, in that the drawn-out process to it ending was what was churned the stomach the most. But once the decision was made, at least the post-breakup healing could occur (although plenty of personal relationships healed quicker than the grief of losing Judd). Gradually, the wide colours of the opportunity that now presented itself replaced the doomy grey of impending heartbreak. Who would Judd nominate as his club of choice? Who would we get in return? What was the best deal at the trade table for all parties concerned? How can this be turned into a draft opportunity? Losing Judd was both a major loss and a major moment. 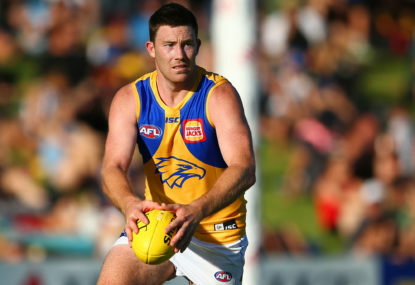 To have Jeremy McGovern re-contract for another five years ends the speculation of whether the relationship will end and brings forth only joy at the potential of the future with him in the side. That particular piece of the puzzle is now in place and the fans can turn their contract-related attention to Andrew Gaff and Scott Lycett. But, of course, this attention can really only be speculation, given that the AFL does not release player contract information and fans and media alike can only speculate on how the salary cap is bundled together across an entire list to produce a whole. Fans often laugh in dismay at how members of the media quote ‘sources’ to report on the likelihood of a player leaving via trade or free agency. This guesswork is enhanced in its speculativity by the fact that there is imperfect information at play. The NBA and many other American leagues release player salary information in a way that is open and transparent, which spawns an entire media expertise revolving around team expenditure, within a complicated salary cap and tax system. For the casual follower, it is pure noise. But for the dedicated fan, it spurs discussion about a team that truly enhances the experience beyond simply barracking for your colours. The role of ‘list manager from the front bar’ would be much more informed, beyond thoughts of ‘we should pay Andrew Gaff $1 million a year’, which unfortunately is a comment devoid of any substance, purely by a lack of decent context. Economics 101 suggests that a well-functioning market (including say, a free agent market) relies on perfect information being available – which is generally impossible, but in the case of the AFL is blatantly stifled. We know there are a few million-dollar-a-season players. We also know via the AFLPA that the average wage is approximately $371,000 a year. But using average numbers adds little value. In fact, the mere mention of this as an average falsely locks it in as what behavioural economists would call an ‘anchor’. The anchor point is simply a psychological bias that clouds judgement, and in this case would distort any discussion around any given players market value. It’s misleading information. It does go against the Australian mindset to release contract information. It sits somewhere between ‘bugger off’ and ‘working-class man’ in the Australian psyche that this kind of information might be made public – in short, it’s kind of out of bounds in a social policy sense. There is an expectation of humility about those that have risen up to succeed, mixed with a subtle desire for tall poppies to be cut down. But in sport, we celebrate our champions and rarely deny them receiving mega paycheques (which, in contrast to other sports globally and even the corporate sector, is actually very small) – so there is no need to be so sensitive about this information. The fans would love to know where a contract bargain might lay and it would surely benefit those players in bottom of the pay ranks to have that information in the mainstream. It would allow those that truly want to invest in contract analytics and the niche fandom of team number crunching to indulge to their hearts’ content. It would change the face of contract speculation away from statements such as ‘war chests’ and into something that might even be evidence based. So what, if any, reason is there really against withholding this information?